You can never have too many decorative coasters. I leave my Turkey Coaster out all year long because it's just so cute. But maybe it's time to (also) have a non holiday-themed coaster out so people can stop asking why I have a turkey on my desk in January. This cozy and matching coaster is going to be a Christmas gift, and I can't wait to make more! You can get creative with the color combinations and make it totally customizable. 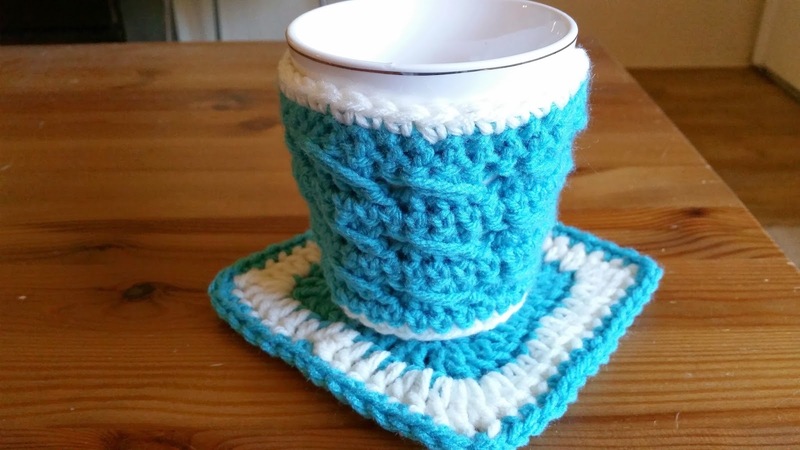 The pattern can easily be adjusted to fit any size mug too. 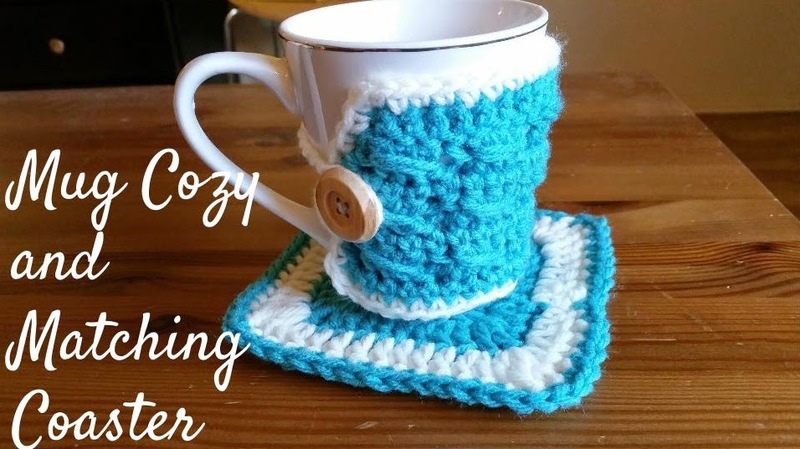 If you're like me and love various types of mugs, this pattern is great because you can make different sized ones. It works up so quickly and makes me want to make a bunch for myself and friends and family. It's a perfect way to spruce up any boring, dollar store mug and make it special. I got my mug from the Dollar Tree, and it's a pretty standard sized mug. They had so many different colored mugs, but I wanted a simple one since I'm making this colorful cozy. 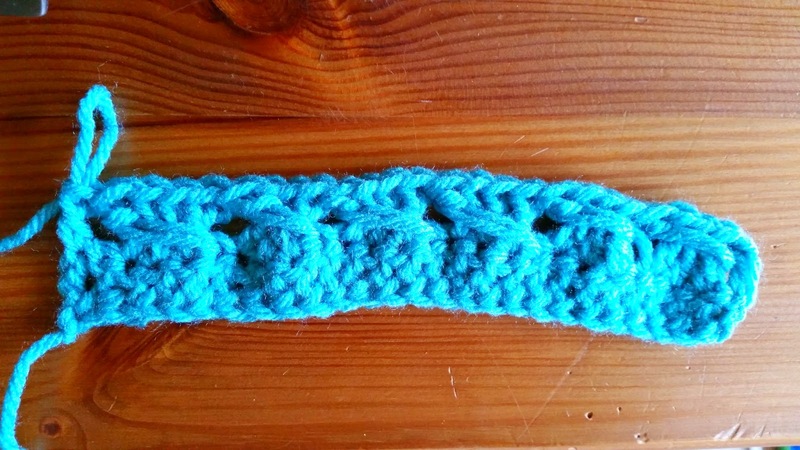 I used this cable stitch for the pattern. Skip the next st. Dc in next 3 st. Working over the 3 dc, yo and insert hook into the skipped st. Pull up a loop to the height of the dc's. Yo, pull through 2 loops. Yo, pull through last 2 loops. 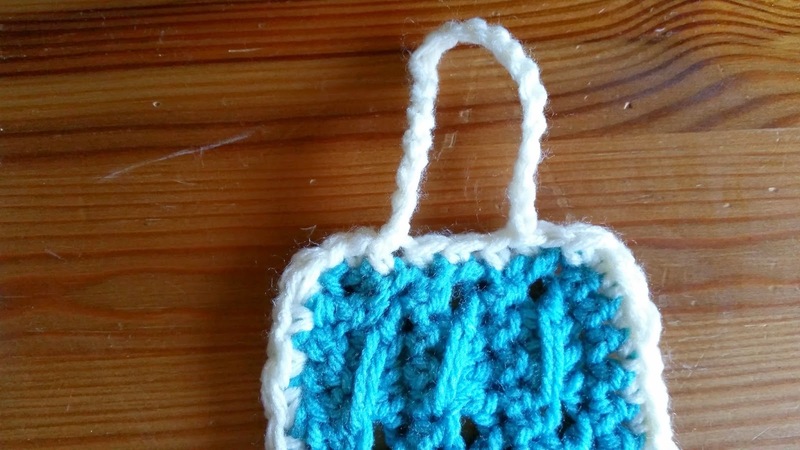 The chainless double crochet at the start of rows/rounds counts as a stitch. 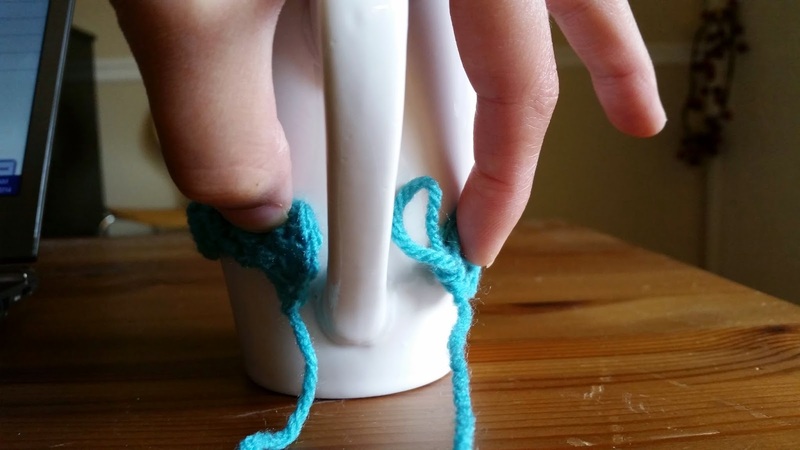 In Aqua, make a fdc that is long enough to wrap around your mug from handle to handle, making sure that it is a multiple of 4+2 (Alternatively, you can make a ch and dc across). In my case, I made 26 fdc. 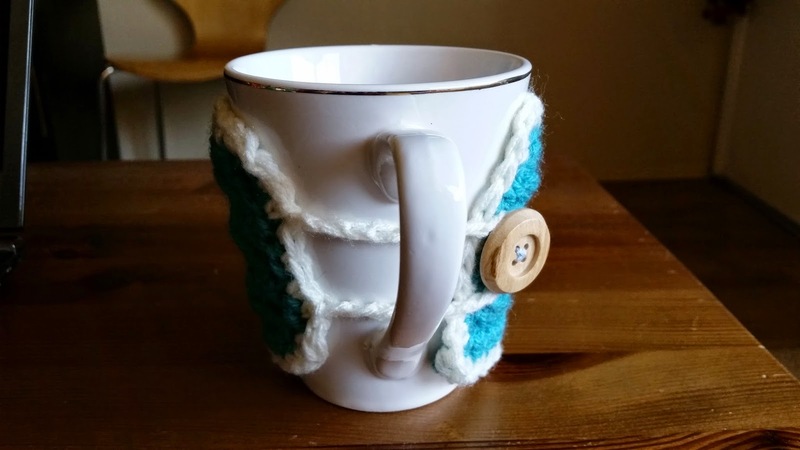 Err on the shorter side to get your multiple since we will be connecting the cozy around the mug with a loop and button later. See my post on the Cabled Slouchy Beanie for instructions on how to do a fdc. 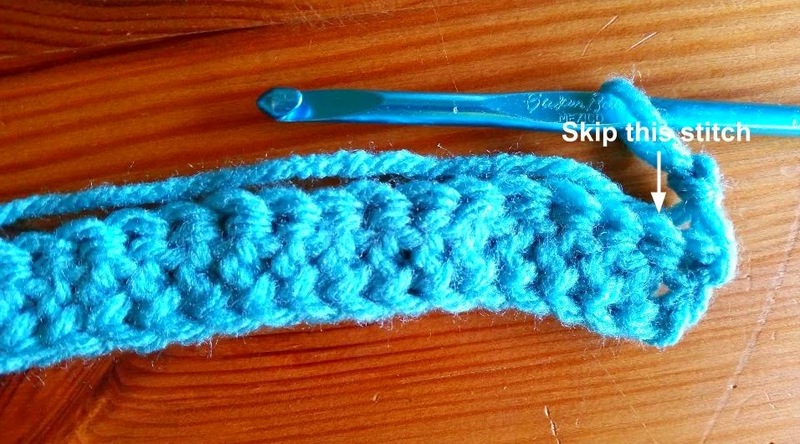 Make a chainless double crochet (or make a ch 3). Cable stitch across. Dc in the last st.
Ch 1 and turn. Sc in each st across. 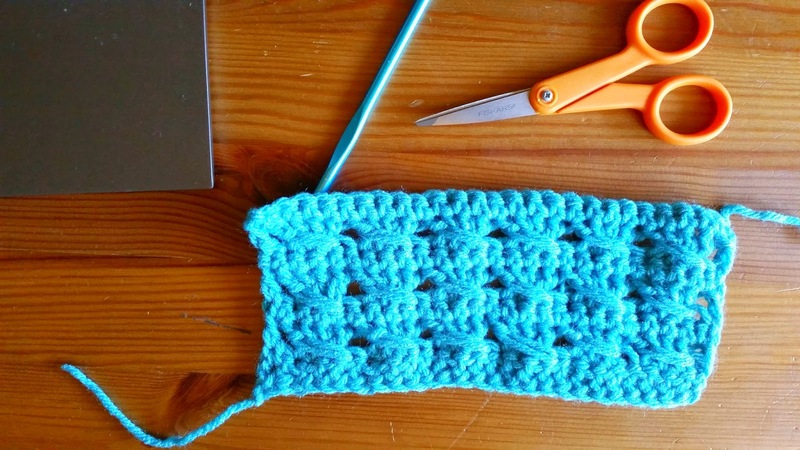 Repeat Rows 1 and 2 until the cozy is the desired height, ending on Row 2. In my case, I completed 6 rows. I wanted to leave a bit of space between the cozy and the top of the mug so that you can actually drink from it with the cozy on. Join with a sl st to the corner of the cozy in Aran. Ch 1 and sc around the edges, making 2 sc in each of the corners. Join with a sl st in the beginning sc, not the ch 1. Turn, sl st in 2 st. This number may be different for you if you made more rows than I did. 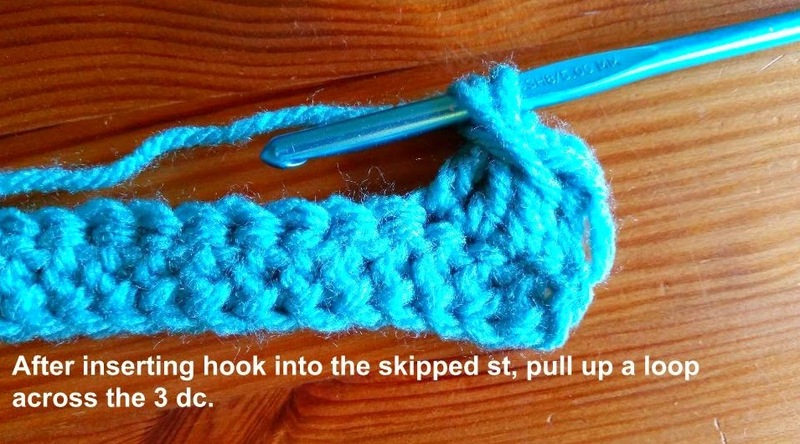 You'll just want to make sure that there are an even number of stitches between your loop and that it's centered. I had 8 sc on the side, so I left 2 sc on each side of the loop. Ch 20. Skip 2 st and sl st in the next st.
Fasten off and weave in any loose ends with the tapestry needle. 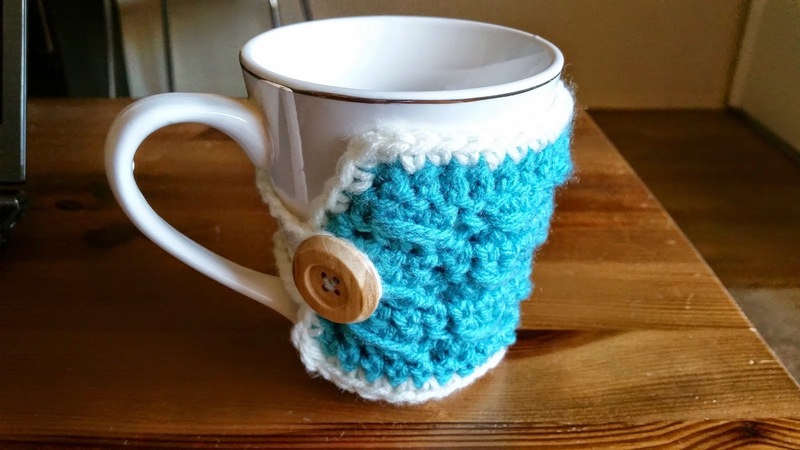 Sew on the button on the other end of the cozy and fasten the cozy on your mug! In Aqua, make a magic circle. Ch 1 and make 12 dc in the circle. Ch 1 does not count as a st. Join with a sl st.
Ch 2 (counts as hdc). *Dc in next st. 2 dc in next st. (Dc, tr, dc) in next st [this is the corner of the square]. 2 dc in next st. Dc in next st. Hdc in next st.* Repeat from * to * around, ending on dc in last st. Join with a sl st or use the seamless join. Fasten off. I like to use the seamless join when changing colors because it looks a lot neater, and since I'm fastening off anyway, I might as well use it. It's a little less convenient when you're using the same color as you have to fasten off each time you join. 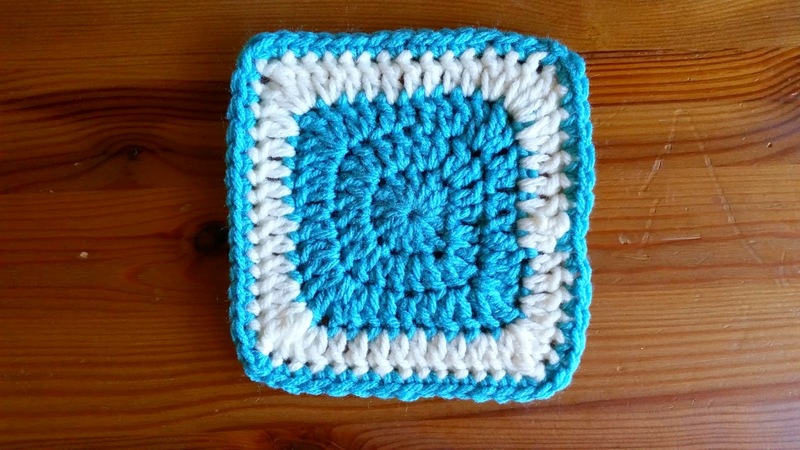 With Aran, join with a sl st in the corner of the square (in the tr of the corner). Make a chainless dc. (Tr, dc) in same st. 2 dc in next dc. *Dc in the next 7 st. 2 dc in next st. (Dc, tr, dc) in next st. 2 dc in next st.* Repeat from * to * around. Join with sl st or use the seamless join. Fasten off. In Aqua, join with a sl st anywhere in the square. Ch 1 and sc around, adding 2 sc in each corner (in the tr st). Join with a sl st. Fasten off.